Compact Roland 15watt Cube Amplifier with built in effects. Like new, played only a few times in my bedroom. No sign of wear or use or any type of defects. Please note it comes with original Celestion 70/80 speaker. Works great, very clean, no rips. Needs new knobs soldered on. They cost about $4 online. Other then that works perfect. Amp in mint and exceptional condition. Very little use, home only. first time I have sold on reverb so don't hesitate to message me. In VG working order. Brand new correct AC replacement. Fender Hot Rod Deluxe III Black in excellent condition new but shop model. 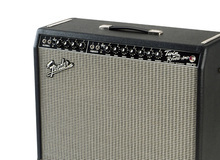 Here is a well maintained Supro amp. It is in great condition. It comes with the Supro custom cover and the footswitch. These have great clean sound and take pedals very well. Parting out my rig. Awesome amp, sounds great. Prefer pickup in Boerne, TX but can ship if needed. Great amp. Appears to be all original. Mesa Boogie Mark V 1x12 Combo, pristine condition. Never gigged with, light usage, perfect working condition sounds and plays excellent. Comes with owner's manual and tags.